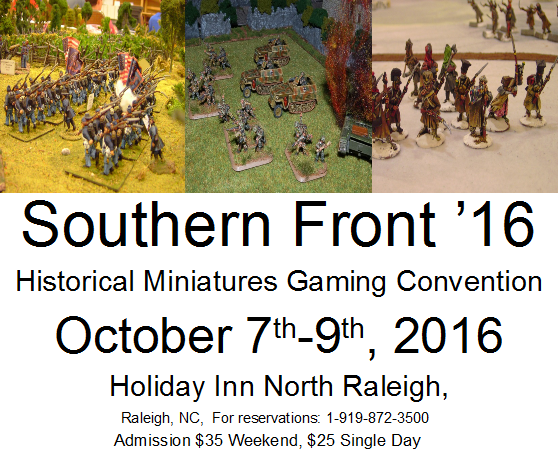 Southern Front 2016 is a go! Below is a newer banner image for the event which I have additionally added to the Southern Front site proper. I’ve NOT yet activated the registration links as I still need to update a few things behind the scenes but those should be active witihin a few weeks. I’ll post news here and on the TSS Yahoo list when the links are all active. This is the same hotel from last year, it just goes by a slightly updated name now. It is now known as Holiday Inn Raleigh North – Midtown and its address is 2805 Highwoods Boulevard Raleigh, NC 27604. Previous Previous post: Cold Steel 2016 a Go! Southern Front 2018 – Final PEL posted!